North Carolina’s governor, Pat McCrory, has vetoed an ag-gag bill that would make it illegal for whistleblowers and journalists to expose abuses in a wide range of industries. North Carolina’s House Bill 405 would have allowed business owners to sue employees who record damaging activity in the workplace without their boss’s permission. 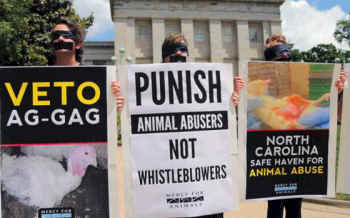 The bill was part of a national “ag-gag” trend to stop undercover investigations of factory farms by animal welfare groups. One group, Compassion Over Killing, recently documented workers at Mountaire Farms punching, shoving, and throwing chickens. That includes “nursing homes, hospitals, group homes, medical practices, charter and private schools, daycare centers, and so forth,” the group says. The public is overwhelmingly against ag-gag laws. A recent survey by the ASPCA showed that 74 percent of residents in North Carolina support undercover investigations by animal welfare groups. Ag-gag laws are currently being challenged as unconstitutional in Utah and Idaho. While I support the purpose of this bill, I believe it does not adequately protect or give clear guidance to honest employees who uncover criminal activity. I am concerned that subjecting these employees to potential civil penalties will create an environment that discourages them from reporting illegal activities. Find hundreds of Vegan Recipes!